Chandler Harkins finished 13th and Evan Klouse 25th as the Boulder City boys cross-country team finished in sixth place at the Division 1-A State Cross-Country Championships Saturday in Reno. 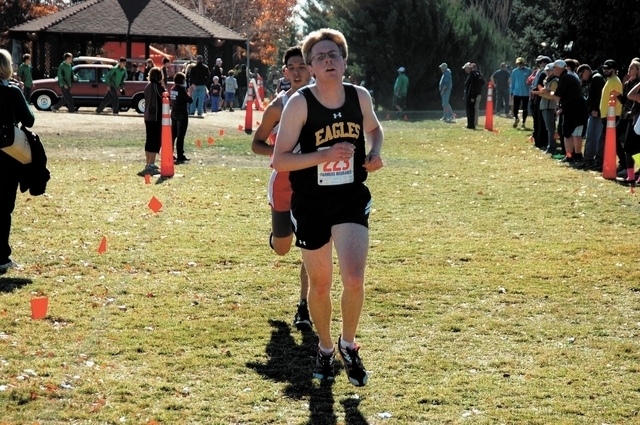 Harkins ran 17 minutes, 59 seconds over the 3.1-mile course at Rancho San Rafael Regional Park in Washoe County. Klouse had a time of 18:42. The Eagles scored 123 points to finish behind champion Elko, which had the winning low score of 48 points. “Chandler and Evan have led the team for three years and it has been a fantastic run,” Eagles coach Canaan Petersen said. “Combining both of their efforts in their careers, the boys team has secured one regional title and three straight trips to the state tournament. Also competing at state meet for the Eagles boys team were Christian Shamo, Joren Selinger, Caleb Shamo, Tyler Campbell and Austen Brown. Jessica Embro finished in 26th place as the only female runner from Boulder City in the girls state meet. The Lady Eagles did not have enough athletes to compete for the team championship, which Truckee won. Six Boulder City athletic teams are practicing and will begin their exhibition seasons by the end of the month. They are boys and girls bowling, boys and girls basketball, girls flag football and wrestling. Today and Friday are the final days to sign up to play in the Boulder City baseball team’s second annual Texas Hold’em Poker Tournament, which begins Friday at the Hacienda Casino at 6:30 p.m.
A $50 buy-in will get each player $2,000 in tournament chips. There will be reduced rates for drinks and free finger foods, hats and T-shirts. There are special prizes for any player who knocks a baseball coach (Bobby Reese, Alex Moore, Tim O’Neill, Chris Morelli and Johnny Nelson) from the competition. For more information, call Reese at 702-218-5866 or email RWR941@interact.ccsd.net.